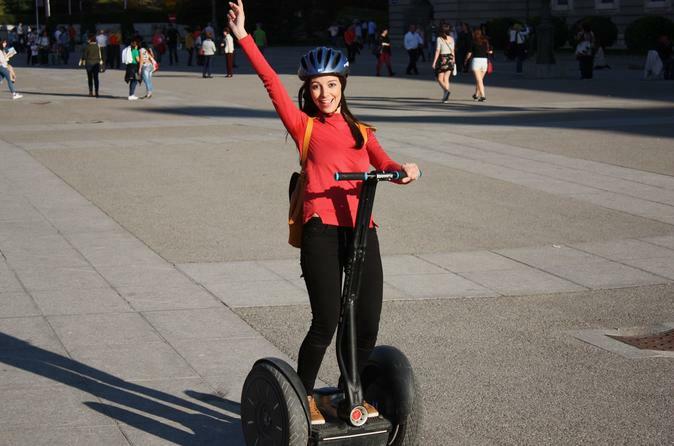 Ensegway Madrid gives you the chance to visit our city in a different and funny way with this fantastic Segway Tour of 1 hour and 15 minutes. With the help of our guides enjoy a SEGWAY TOUR in the heart of the city and knowing neighborhoods as characteristic as the Barrio de las Letras, Madrid de los Austrias or La Latina. Our segway tour of 1 hour and 15 minutes departs from the Ensegway Madrid office at Street Union number 4, near the Opera Underground station, in the city center. One of the most demanded options is the one that visits the "Madrid de los Austrias", a tour that visits both the oldest neighborhood in Madrid and the surroundings of the Royal Palace and the Almudena Cathedral, an area full of stories and legends that our customers will definitely enjoy riding a Segway. It is ideal for families with children, since much of the circuit is restricted to traffic which will make the experience even more fun. Another very pleasant alternative is the "Barrio de las Letras". This option is a wonderful tour of the writers neighborhood. We will enter the emblematic Huertas street, with its golden letters that show us fragments of the works of our most valuable writers. Then we will visit the house of Miguel de Cervantes and later the Golden Mile without doubt an essential point. The space that holds the most works of art in the world, as well as the world-famous Prado Museum. A perfect ride for art lovers.